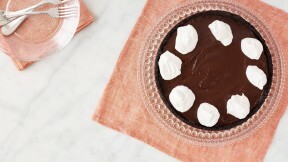 Martha Stewart's Mississippi Mud Tart recipe was featured the Gulf episode of Martha Bakes. Preheat the oven to 375 degrees. In a food processor, grind wafers and pecans until fine crumbs form. Add melted butter; process until moistened. Transfer mixture to a 9-inch springform pan; press into bottom and up the sides (use the base of a dry measuring cup to help). Bake until fragrant, 8 to 10 minutes; let cool. Place a large fine-mesh sieve over a medium bowl; set aside. In a medium saucepan, off heat, whisk together 2/3 cup sugar, cocoa powder, cornstarch, and salt. Whisk together milk and yolks. While whisking, slowly add to pot, being sure to incorporate the cornstarch. Over medium heat, whisking constantly, cook mixture until the first large sputtering bubble forms. Reduce heat to low; continuing to whisk constantly, cook 1 minute. Remove from heat; stir in 1 teaspoon vanilla, remaining 2 tablespoons cold butter, and milk chocolate until melted; immediately pour through sieve into bowl. Pour pudding into crust. Place plastic wrap directly on surface (to prevent skin from forming); chill at least 2 hours and up to 1 day. Just before serving, beat cream, remaining teaspoon sugar, and remaining teaspoon vanilla until soft peaks form. Dollop or spread whipped cream over pudding before serving.